MWWWI published a monthly newsletter for a year then stopped due to time constraints and other considerations. We are including them here because they give some background to MWWWI beginnings and to the interesting cultural highlights we experienced during our stay in the UAE. Click on the title to open up the newsletter. They are in pdf form. If you do not have Acrobat Reader, please click here for the free download. My name is Haleemah Muhaymin, not too long ago I learned that women around the world do not have access to the necessary feminine supplies needed to function on a daily basis. Girls do not attend school at least one week of every month because they do not have the necessary sanitary supplies needed when they have their period. For the past two years I’ve sewn purses and donated them to the Sew Powerful Organization based in Washington State, which then fills them with the sanitary supplies. The filled purses are taken to Lusaka Zambia and are gifted to the girls. I am so humbled and very honored to be a part of that, but I want to do more. 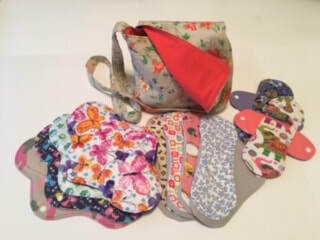 I began researching how to make quality reusable cloth period pads and I started sewing. My mission (to empower girls), is to gift as many girls as I can in Africa and worldwide with a purse and ten sanitary pads inside. Having a period and proper protection should not be a hardship on any female especially for young girls who lose so much time every month during their educational years. If you want to be a part of this great cause you can donate the materials to make the pads: I will recycle gently used 100% cotton clothing such as flannel, quilter’s cotton, fleece or you can purchase any of the above mentioned fabric and/or PUL by the yard. *The girls love color and pretty designs. Email me at- ummyouseff@yahoo.com - if you are interested in donating fabric or would like to sew and donate a purse. All content is copyright of the authors and/or mwwwi.com. Permission must be sought from the authors and/or mwwwi.com should you want to reproduce any material from this web site. Read our Disclaimer here.